2010 brought another batch of POMO Roxy Music remixes, this time skirting the Color Series designation. That’s not the only difference with this release. For the first time, the songs were remixed by the same producer, giving the batch a unified feel that the earlier issues studiously lacked. Cinnamon Chasers [a.k.a. Abakus, a.k.s. Russ Davies] was the whole show. Could he carry the event all by his lonesome? The first track is another crack at “While My Heart Is Still Beating,” which Davies had previously touched under his Abakus moniker. It’s a slightly trance-touched mix with full vocals remaining, though Ferry’s take on this track, with his delicate falsetto, was always dreamlike and diaphanous to begin with. Beefing the cut up with a prominent rhythm track is a chancy proposition at best. Davies has an ear for melody though, and the cut never succumbs to ham-fistedness. Less is often more when it comes to remixing [unless you are Trevor Horn]. The sax and guitar of MacKay and Manzanera remain, as do the touches that I likes from the earlier Abakus remix, like the synth patches he added. But the tempo here has been made more insistent with a faster bpm. Personally, I prefer the Abakus take. It was slower and funkier, which suited this music better. Amazingly, there’s not a Soundcloud widget to embed, this time, so you’ll have to trust my judgement. Someone at Ferry HQ was sleeping on the job, which is unusual since they are normally working that action like the pros they are. The take of “The Main Thing” is another double dipper remix, having been part of the Orange issue. The mix here is typical of the Cinnamon Chasers modus operandi. The tension is maintained by the prominent, new, beat but dreamlike touches in contrary fashion are used throughout. Ferry’s vocals are maintained throughout, but as with the first cut, his tremulous falsetto was barely there to begin with on the already ambient “Avalon” original tracks. The contrapuntal bass loops add an urgency with Electribe 101 being a touchstone for the elctrohaus vibe. The introduction of birdsong synths after the bridge are the cue for the spots on the mirrorball. Finally, the “Always Unknowing [Cinnamon Chasers Bonus Ambient Remix]” is in fact, the same track that appeared earlier on the Blue EP, so careful shoppers should not be taken in by the altered title! 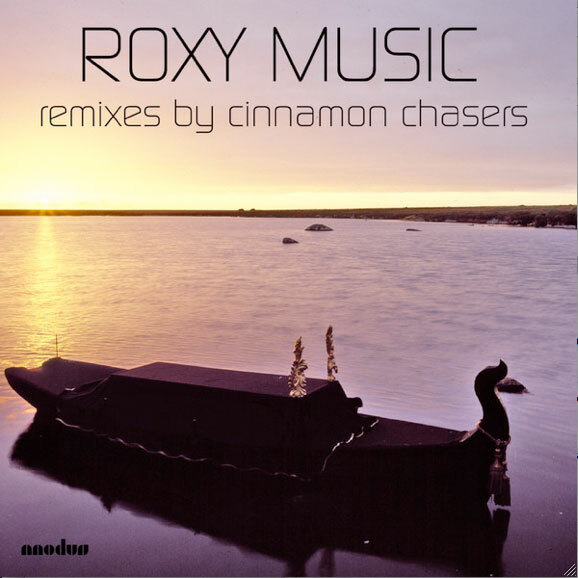 At the end of the day, the Cinnamon Chasers remix ethos reveals their weakness when grouped together in a whole, as opposed to being part of an amalgamation, as on the Blue issue. I can’t say I disliked them, but together here, they resulted in a slightly soporific vibe that had be almost nodding off when coupled with the stop-and-go interstate traffic I was in yesterday. There is one more official POMO Roxy Music issue, but alas, I’ve run out of time. Vacation begins tomorrow and its a long one, so at best, there will be some redux posts until my return. I’d prefer a neat and tidy week of theme posts, but the last chapter must wait for another time. In the meantime, keep your feet on the ground and keep reaching for the stars. This entry was posted in Core Collection and tagged 2010, Avalon, post-modern remix, Roxy Music. Bookmark the permalink. Yes, this “Main Thing” remix presses my pleasure buttons and really turns this into club material. Now I’m going to have to investigate getting at least a digital version of these POMO remixes, since thus far about 80-90 percent of them meet with my approval. chasinvictoria – Yes, quality control at Ferry Central is rather high for this sort of thing. If you like these, by all means get the “Olympia Remixes” bundle! 31 tracks/3.75 hours for $14.99, and it’s 94% good. Maybe 95%. That’s an “A” in my book. Many of the same mixers show up there and their taste didn’t desert them. Agreed, the Olympia bundle is pretty damn brilliant! I wonder just how much more Post Boys & Girls material Ferry has to cobble into an album after Avonmore. I am a HUGE fan of 80’s/90’s solo Ferry and the particular style he has minded for the past 30 odd years. But the story of the origins of much of the more recent material sometimes overshadows the actual tracks themselves. The best example is the Mamouna/Taxi material and how they grew out of the stymied Horoscope sessions. Ferry can’t seem to release anything without the backstory to how long the tracks have existed in one form or another. I don’t mean to sound critical, I just really want something that has an immediacy from Bryan Ferry or even something unexpected at this point. When he played the new single Loop De Li at the recent NYC show I thought I was actually going to get Limbo…it felt that familiar. Echorich – Personally, I felt that “I Thought” from “Frantic” was a late in the game masterwork.